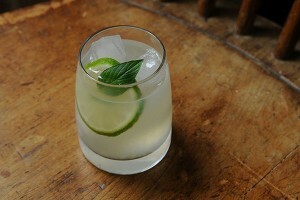 If you like Gin, you will love this simple refreshing summer cocktail! Thanks to food52.com for the recipe! Pour all liquid ingredients over ice in a cocktail shaker and shake well. Strain into two glasses filled with ice. Garnish each glass with a sprig of mint or basil and a slice of lime.